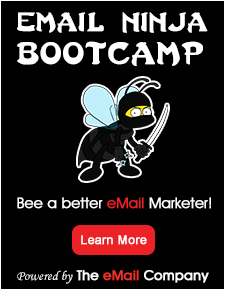 If you’re like me, you take great pride in creating email marketing messages that are just right. You know that email marketing works and that it deserves the effort required to engage your customers and inspire them enough to click your links. This is why you follow a pre-send ritual and make sure every email you create is as good as it can be before you send it off to customers. But even after all that, sometimes things don’t go as planned. Sometimes you look at your email report and it becomes clear that it didn’t perform quite as well as you were hoping. And when this happens, it can be quite depressing. Don’t let it stop you though. We’ve all been there at some stage, and the important thing is that we learn from the experience. Plus when you break it down into tiny pieces, writing emails that get opened, read and clicked doesn’t need to be so hard. Simply find what works for your audience and continually test and measure new things over time. That said, getting a little help from others doesn’t hurt as well. Read on to learn some of the most important things that I’ve learned about what it takes to write emails that get opened, read and clicked. Ready? Let’s go. Let me ask you a question. When you see a bunch of new emails in your inbox, which do you read first? Do you start with emails from people that you know and trust? Or with the emails from people that you don’t recognise? Simple choice isn’t it. We’re naturally inclined to read emails when we have a positive relationship with the sender. We trust them because we either know them personally (or feel like we do) or they’ve demonstrated their value to us in the past. And that’s what you must aim for if you want readers to be waiting in anticipation of your emails. 1. Write as if you’re talking to just the one person. This instantly makes your emails more personal and forces you to be 100% focused on the person reading your email. Avoid generic words like ‘customer’ and ‘subscriber’ and replace them with words like ‘you’. 7. Focus on the benefits. Remember your subscribers are only interested in what’s in it for them. They don’t care so much about your ‘July Newsletter.’ But they probably do care about the ‘Free tickets + Discounted Widgets’ which they can learn more about if they open your email. 11. Look to others for inspiration. There is no shame in looking to your peers for help. In fact they’re an excellent resource for inspiration and helpful tips. So take a moment to subscribe to some top performing brands. It won’t hurt to subscribe to some of your competitors while you’re at it. Next time you’re stuck with your email subject line and can’t seem to get it just quite right, go to your inbox and see how others have approached the subject line in emails similar to yours. So you’ve got people to open your emails. Well done! But your job isn’t over just yet. Readers can still lose interest and move on to something else, undoing all of your hard work in less than a second. And you don’t want that. Instead you want them reading your email and clicking your links to find out more. 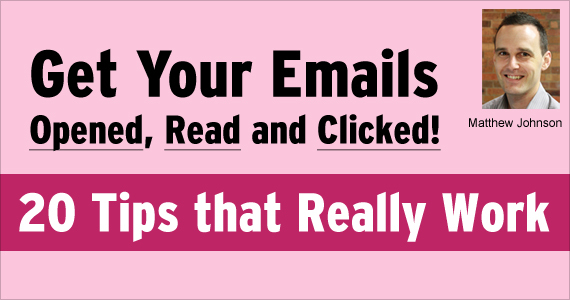 Here are some tips to help you create engaging emails that entice readers to click. 15. Keep it simple. Respect your reader’s time and get to the point. Don’t complicate your email with long-winded sentences, and try to stick with one key message per email. So these are some of the most important things I’ve learned about what it takes to write emails that get opened, read and clicked. They’ve worked for me and hopefully they’ll work for you too. Takeaway: Find what works for your audience and continually test and measure new things over time.